This is a traditional recipe from my mother’s kitchen. 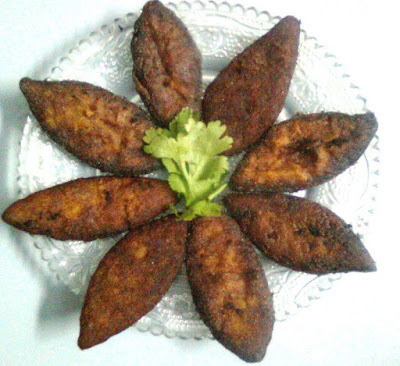 It is very delicious and can be had as a snack or as a side dish with rice and dal. There is another variation of shami called the ‘Shami kabab’ which contains more spices. Add all the ingredients in a pressure cooker except lemon juice and rice powder with 1/4 cup of water. Cook for 5 minutes. Do not overcook the dal as the shamis will sputter when fried. Open the lid and add lemon juice. Cool for some time. Then grind it into a fine paste. Do not add water. In case the shami mixture is very sticky, add rice powder and mix well. Divide it into equal portions; pat them into any shape and shallow fry in oil 2 or 3 at a time. Cook till the shamis turn brown in colour. Serve hot as it is or with tomato sauce. Shami will always be Hyderabads Shan!! !